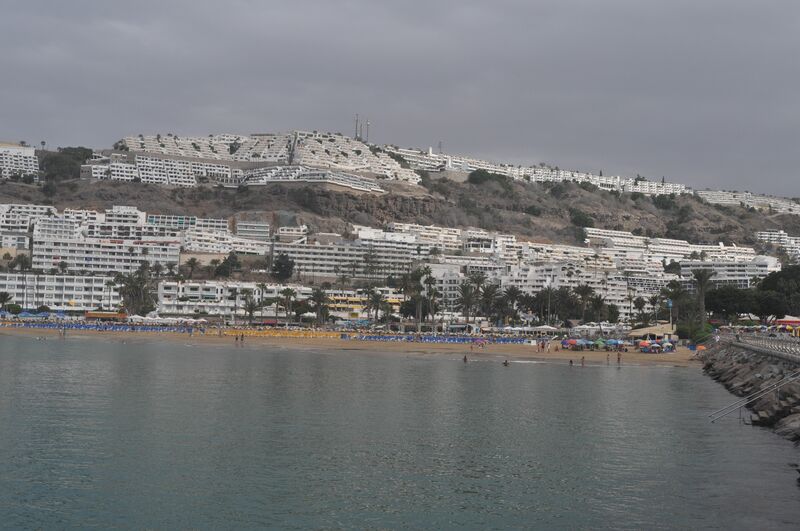 The beach and backdrop at Puerto Rico, Gran Canaria. 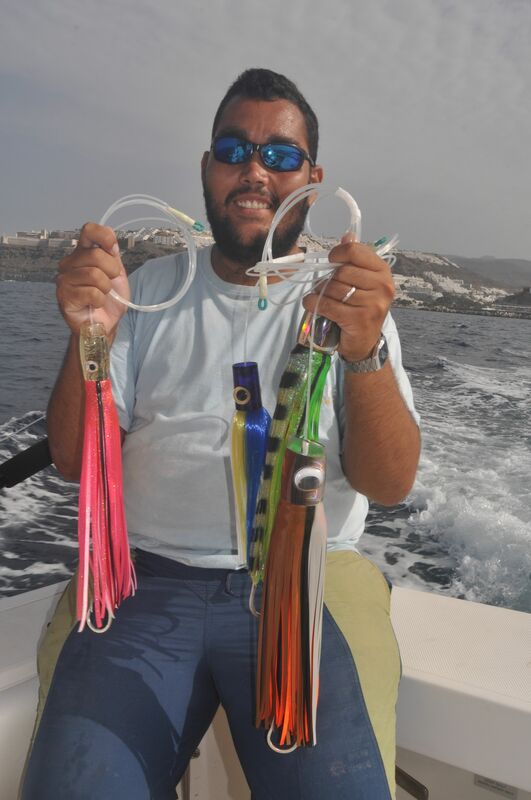 My most recent trip was to The Canary Islands, more specifically Gran Canaria to fish with Roger Burston who runs Reel Escape Sport Fishing Charters based at Puerto Rico. Easily reached with around a four hour direct charter flights from pretty much any UK or European regional airport, The Canary Islands have long been a popular destination with holiday makers from all over Europe. Consequently you will find a massive tourist infrastructure with a huge range of accommodations to cover all budgets, and near guaranteed sunshine. 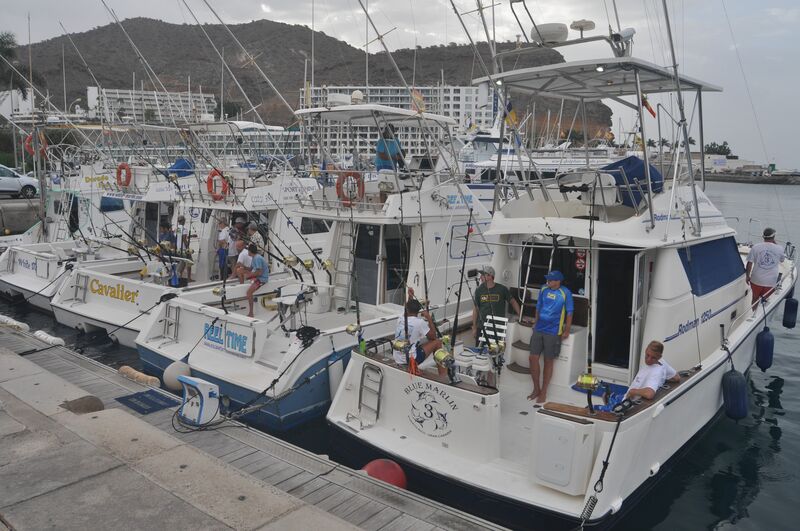 The sport fishing fleet based at Puerto Rico, Gran Canaria, ‘Reel Time’ sits second from right. I’ve been aware of various sport fishing operations throughout The Canary Islands for some time, though I thought mostly these concentrated on short tourist trips, and that the few billfish I had heard about were little more than lucky catches. My understanding was that the only serious sport fishing was based on the island of La Gomera, how wrong I was. Roger runs two excellent big game boats, both equipped with the highest quality Shimano Tiagra reels and rods. Boats are equipped with quality Shimano Tiagra reels. Big blue marlin are caught off Gran Canaria, along with La Gomera and other islands. To give you an idea of just how prolific this fishery can be, a recent Billfish Report rated The Canaries as being the 10th best location anywhere to catch your first marlin, many of which average over 500lb. Last year Rogers boats caught 24 blues, biggest fish 350kg and 14 white marlin, along with a lot of tuna. Local commercial fishermen have landed fish well in excess of the I.G.F.A world record. The women’s 50lb class record Atlantic blue marlin was caught off Gran Canaria on August 9th 1986, and weighed 802lb, and both the mens 6lb and 8lb class records are held by fish caught off La Gomera. Further, both mens 80lb and 130lb class records for bigeye tuna, 392lb and 363lb respectively were caught off Gran Canaria, with the women’s 20lb class record, 173lb, being caught at La Gomera. Numerous I.G.F.A Atlantic spearfish records have been caught off Gran Canaria and La Gomera. A selection of marlin lures. Not surprisingly I was eagerly looking forward to my first trip to Gran Canaria, especially as it was scheduled for mid-August, prime marlin season. I was looking forward to four action packed days out on the water, but if you travel to fish occasionally you must expect the weather and local conditions to completely disrupt your plans, and this was that trip. Very strong north-westerly winds resulted in day one being cancelled, and even though we managed to fish the remaining three days, often conditions were very rough. Choppy seas aside, the biggest problem was that the water temperature was several degrees below what is ideal for marlin fishing. 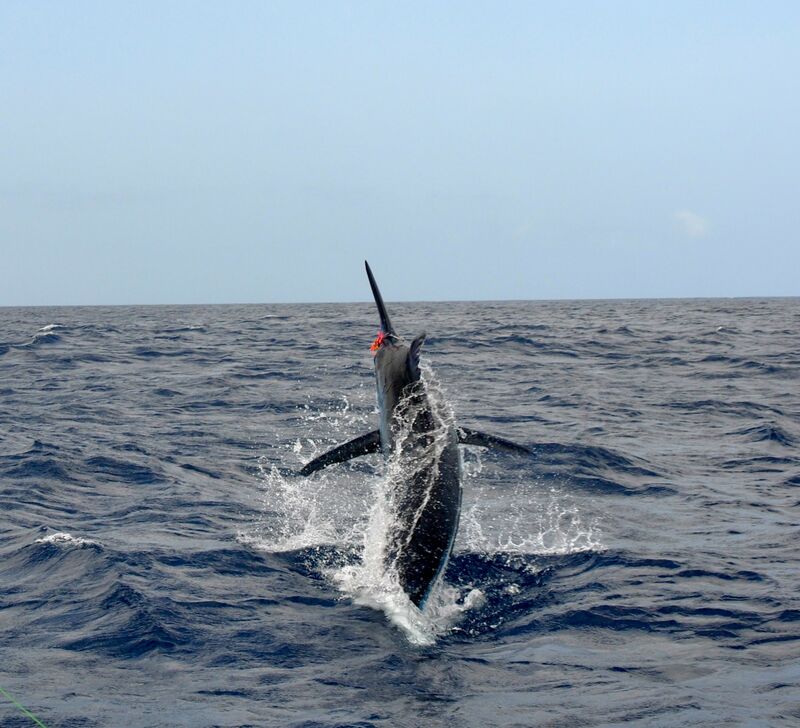 22˚c is regarded as being the minimum suitable for marlin, with 24˚c being the magic number. 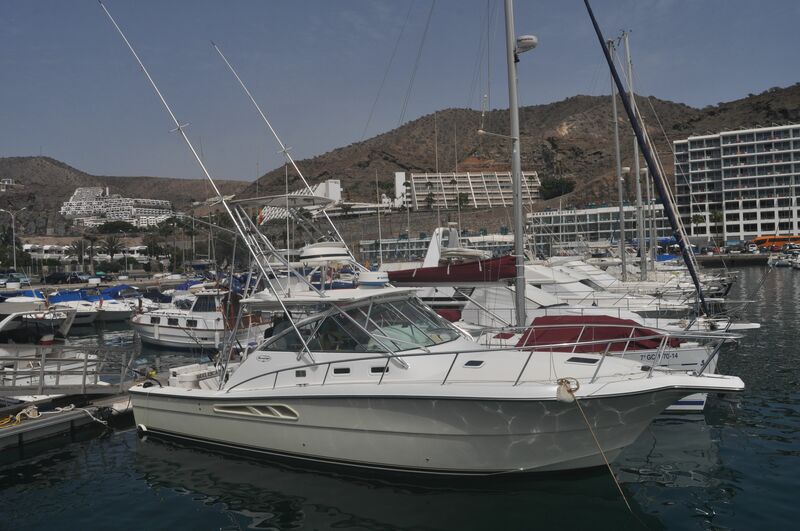 During my trip the warmest water we found off Gran Canaria was 21.8˚c, and all the time I was there only one white marlin was caught on another boat. A little over 100 miles away at La Gomera however the water was warmer, and the fishing excellent. One boat, we heard, had released over 20 blue marlin in 8 days fishing. I guess I’ll have to go back! 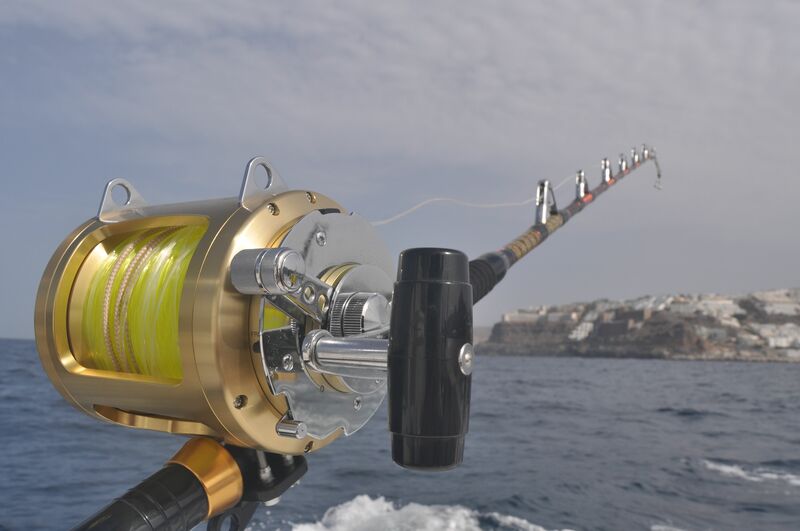 Package trips trips to Gran Canaria including flights and accommodation to fish with Reel Escape Sport Fishing Charters can be booked through Anglers World Holidays. This really is one destination offering serious blue water fishing a relatively short hop from Europe, along with plenty to do for all of the family. For more information Tel: 01246 221717.